The Discovery Tools (Social Search) Discovery tools are social media solutions that effectively act as search engines for social media channels and platforms. Typically, Social Search technologies are freely available, but they don’t allow you to save search queries, download data or export results. Example Discover vendors include: SocialMention, IceRocket, Backtweets, Topsy, and hundreds more. 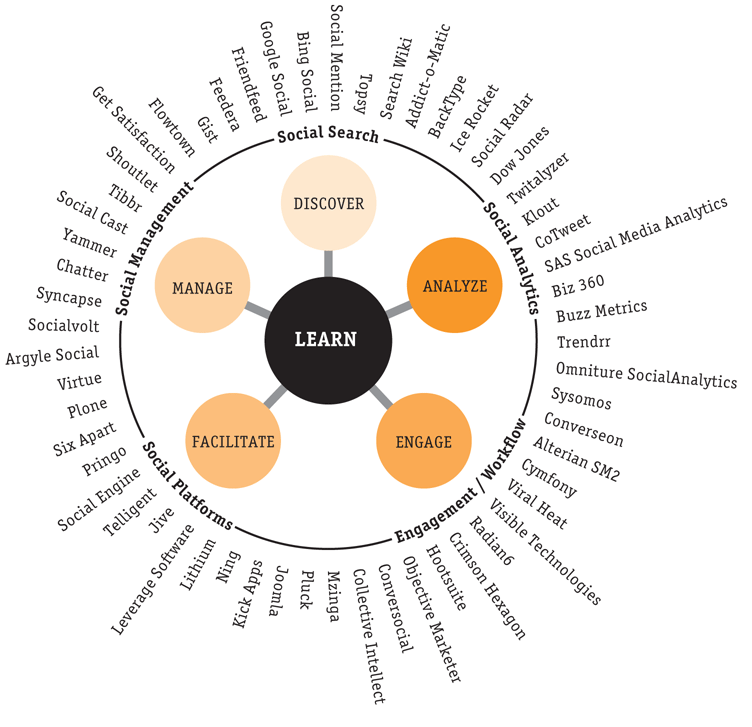 The Analysis Technologies (Social Analytics) These tools are most commonly associated with listening platforms, but in my view, Social Analytics vendor requirements include: filters, segments, visualizations and ultimately analysis. Example Analyze vendors include: Alterian SM2, Omniture SocialAnalytics, Radian6, Sysomos, and many more. The Engagement Platforms (Engagement/Workflow) Vendors in this category extend their Social Analytics capabilities to include workflow delegation and engagement capabilities from directly within the interface, it places more controls at the fingertips of your internal business users. Example Engage vendors include: Crimson Hexagon, Hootsuite, Objective Marketer, Collective Intellect, and many more. The Hosting and Facilitation Tools (Social Platforms) If you need to offer your community a social media destination like a user group, a forum, or a designated social media website. That’s where the Social Facilitation technologies provide a platform that can facilitate the conversation, the dialogue and the learning experience. Example Facilitate vendors include: Mzinga, Pluck, Ning, Lithium, Jive, Telligent and many more. The Management Solutions (Social Management) This group of technology offerings includes social customer relationship management tools, internal collaboration solutions, and social media aggregation services that enable businesses to manage their social media efforts in an orchestrated way. Example Manage vendors include: BatchBook, Flowtown, Salesforce Chatter, Yammer and many more. As you can see, each category has associated vendors. While there is certainly some cross-over here, there is also a lot more depth to each of the categories. For each category, you can delve deeper by specific social media channel (i.e., there’s a whole cast of Social Analytics tools specifically for Twitter). Yet, in a technology environment that is so cluttered with options and new entrants, I feel that some categorization is merited. But what do you think? … Am I on the right track here? Do you use technologies from multiple categories? …What did I miss? Thanks for your comment. Yes, my category of management is very close to Social CRM, but I intentionally avoided that term because I believe that social is not just a flavor of CRM, but in fact an integral part. Salesforce.com is making this a reality as they continue to build out and acquire social technologies to add to the business intelligence and sales support functions. Further, I envision this category not merely as a means to manage your social customers, but also to manage your employees using social technologies. Regarding linking social data with other sources: certainly there many technologies that make this possible. In fact, I’ve worked closely with IBM and Teradata to conceptualize the concept of True Profiles within customer data warehouses. Yet, I still see these capabilities as a data integration elements rather than true social technologies. And yes, you’re right that there can be a bunch of crossover of some of these programs. I could see Sysomos fitting into at least 4 categories you have listed above. Hi really thanx for the article i am looking for the information got this article very informative .